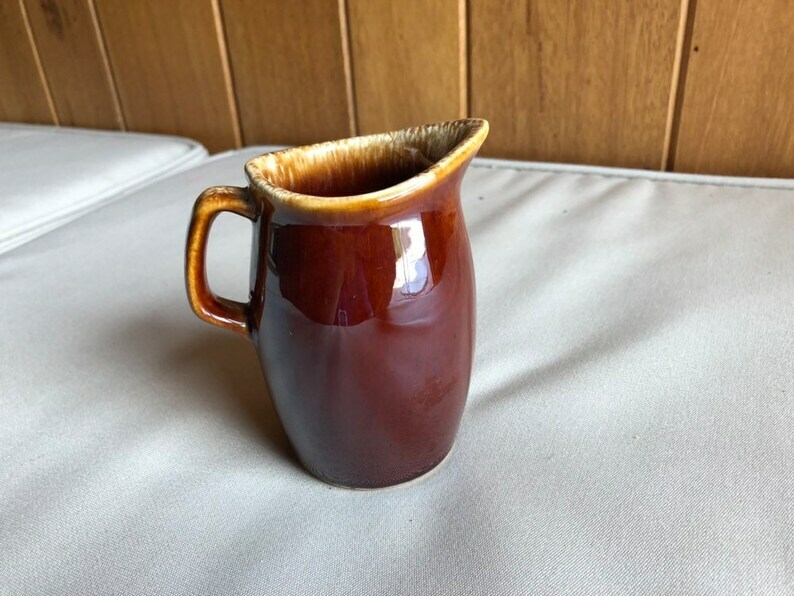 Vintage Hull Pottery Brown Drip Creamer, 4.5" Hull USA Oven Proof. A sweet vintage cream pitcher from the Hull Pottery Company in Brown Drip. Perfect to add to your kitchen collection or use as a vase to display flowers. This Hull Cream Pitcher is in wonderful vintage used condition. There are no chips, cracks, breaks or repairs. The pottery is clean and bright. The brown drip glaze is a rich, deep color with a nice shine. The underside shows a mark where some kind of sticky tag once was. MAKER: Hull Pottery - Bottom is marked: "Hull USA"